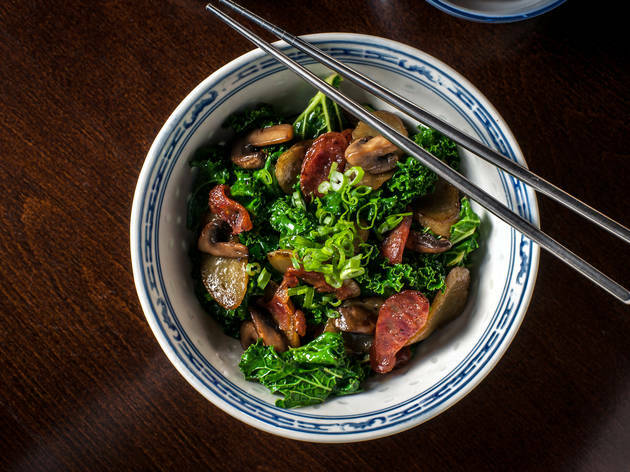 These days, New York’s Chinese food scene is in full-blown revival mode, fueled by red-hot joints like RedFarm and Mission Chinese Food, edging out dated fixations on cheap and “authentic” with promises of locavore and cool. 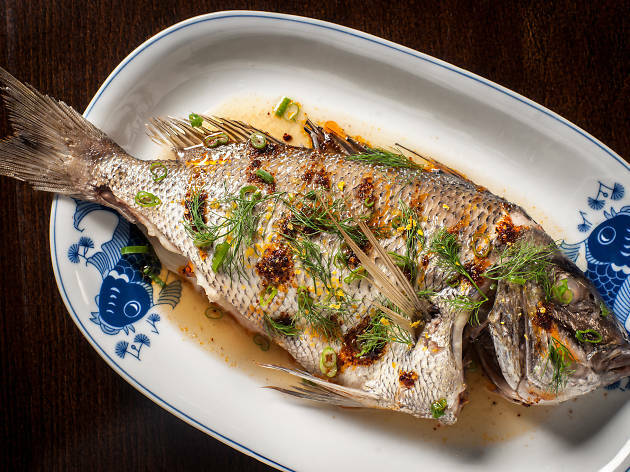 The latest restaurant to take a 21st-century crack at Chinese is Fung Tu, from Nom Wah Tea Parlor scion Wilson Tang and Per Se vet Jonathan Wu. In their slender, wood-rich room, cultural references are subtler than the typical red-lantern kitsch; spindly Pyrex light fixtures—made by Wu’s artist wife—were inspired by Chinese lattice patterns. They cast a gentle glow on tight-sweatered scenesters and beach-wood booths as stiff as church pews. 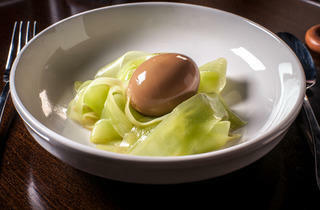 Rather than intensifying flavors, Wu’s cerebral plates subdue them. 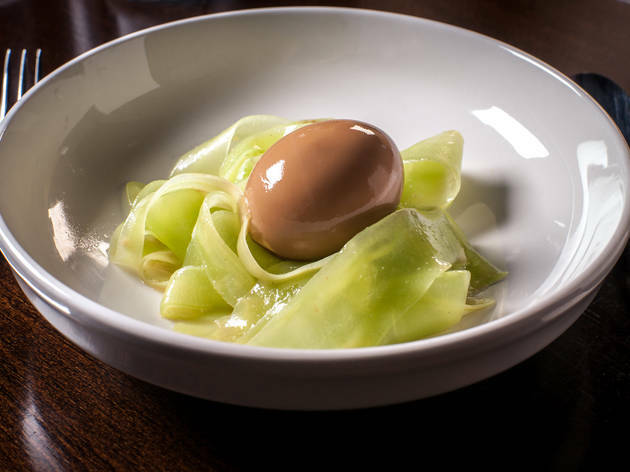 Ribbons of celtuce ($13) are vexingly tasteless, even slicked with buttery popcorn puree and the salty ooze of a soft-boiled, soy-soaked egg. A beige slab of broad-bean curd terrine ($13) is doused with chili oil, but conjures up little more than solid, grainy hummus. More disappointing than these creative offerings are reinterpreted classics sapped of their trademark allure. 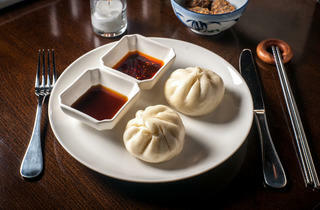 Buttery steamed buns ($12) cocoon a mushy, salt-starved mix of vegetables and glass noodles; a bowl of gummy, spaetzle-esque knots of dough topped with heat-deficient chili-pork sauce ($19) are meant to reference mapo tofu, but recall overcooked Hamburger Helper. 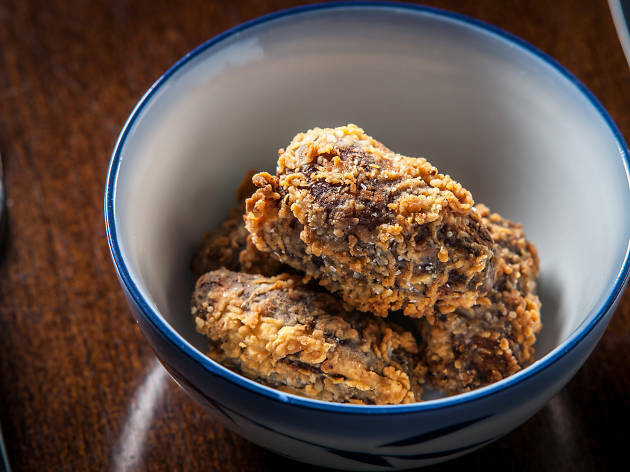 Wu’s best dishes summon more assertive flavors. 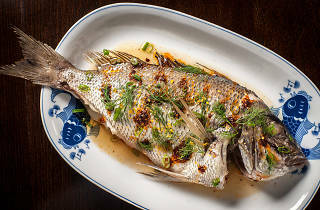 Steamed whole sea bream ($28) is salt-licked by pungent fermented black beans, its silky flesh teetering between briny and sweet. 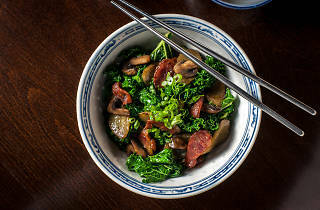 Springy sweet-potato rice cakes ($23) are pure comfort, their meaty chew bolstered by mushrooms, Chinese sausage and crinkly kale. Those rice cakes give you what you’ve been missing all along, the earthy, wok-fired jolt that makes much of Chinese cooking so seductive. 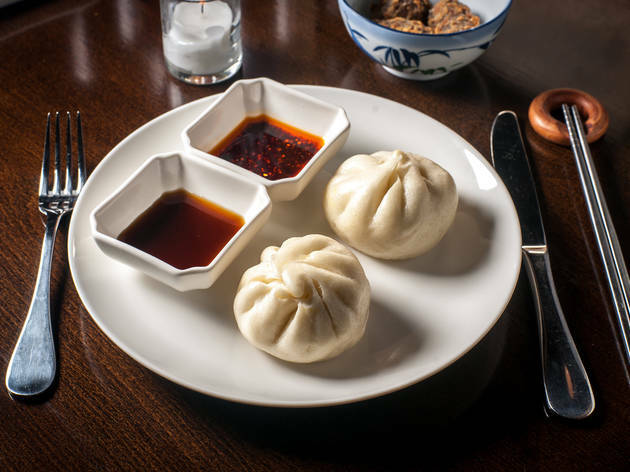 In pursuit of toned-down flavors, Fung Tu too often renders its cooking mute. Behind the bar: Wines are inspired by the nutty, fruity flavors of Asian rice wine; as promised by Chicago sommelier Jason Wagner, a watermelon-accented pineau d’anuis mollifies any chili heat. 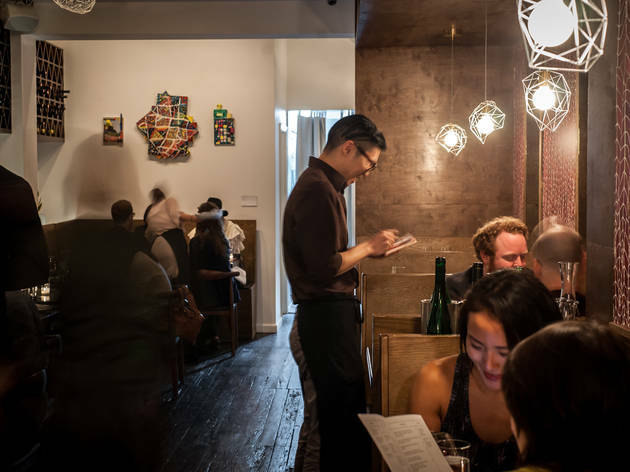 Vibe: If you’re craving family-style dishes whirling on a lazy Susan, walk west to Chinatown; these delicate small plates were conceived for contemplation, not throwdown feasts. 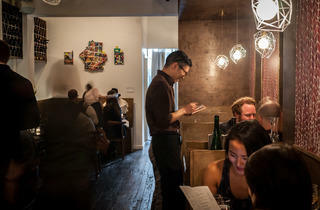 Cocktail chatter: The oxblood-colored wallpaper panels depict toon leaves, a garlicky spring delicacy that Wu’s grandpa grows in his yard in Yonkers. Soundcheck: There may be steamed buns on every table, but this is a far cry from the fever pitch of weekend dim sum. Came in here for dinner with my family because I saw all the good reviews and wanted to check it out. EXTREMELY DISAPPOINTED. THE DECOR-SHABBY, CHURCH LIKE BENCHES FOR SEATING. LIKE A CHURCH DONATION. NOT VERY COMFORTABLE TO SIT ON HARD BENCHES. THE WALLPAPER AND LIGHTING WAS VERY NICE. FOOD- BLAND, TASTELESS, BLAND. 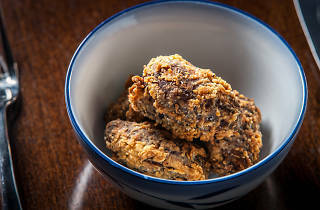 I WANTED TO QUESTION THE SOMMELIER OR THE CHEFS IF THIS WAS REALLY CHINESE FOOD? IT DIDN'T TASTE CHINESE. SERVICE-TOOK FOREVER TO GET A WAITER'S ATTENTION. TOOK FOREVER TO GET OUR FOOD. TOOK ALMOST 20 YEARS TO GET OUR CHECK. GET IT TOGETHER. I CAN EAT AT BETTER PLACES SUCH AS MR. CHOWS, MR. KS, CAFE CHINA, ETC.